Think of drug shortages, and you might imagine short supply of some exotic cancer therapy. But paramedics in the New York metro area are more often frustrated by the broken supply chain of some of the most basic medical injectables. For example, generic dextrose, better known as sugar water, is used to treat people in diabetic shock. Sodium chloride, better know as saline, is a generic product needed to hydrate patients suffering all sorts of maladies. Epinephrine is a generic injectable used to jump-start a failing heart. The FDA first recorded shortages of each of those products more than a year ago. "As a medic I don't understand why there are things like dextrose or epinephrine, things made by multiple companies, and we have a shortage," said Eric Korneffel, a paramedic with North Shore Long Island Jewish Health Network. The FDA currently allows for the importation of saline from overseas, but medical staffs are having to find workarounds for other drugs. Instead of having an epinephrine shot at the ready, Korneffel and his partner Jackie Monaco must waste precious seconds manually mixing the drug in the back of an ambulance. In the absence of dextrose, they sometimes use a less common alternative called Glucagon. Michael Guttenberg, a doctor who manages the Emergency Services Department of North Shore LIJ, one of the largest integrated health systems in the country, says he is constantly sending alerts to his staff with temporary protocols designed to work around drug shortages. "I don't think the problem is getting better," Guttenberg said. "I think we're getting used to it and complacency is a bad thing." According to a University of Utah report, the number of active drug shortages in the United States has increased from 152 in the beginning of 2010 to 265 in the beginning of this year. Several reasons have been offered to explain the broken market for generic injectables in recent years. Some have blamed a series of contamination incidents at drug manufacturing plants. Others have blamed regulatory red tape at the Food and Drug Administration. Still others blame little-known firms called group purchasing organizations or GPOs. They are middleman companies that charge fees to drug manufacturers in exchange for the privilege of selling their products to hospital networks. 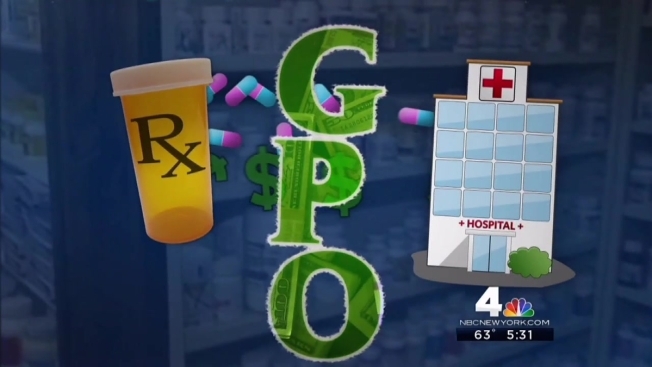 GPO fees are nothing more than legalized kickbacks, if you ask Phil Zweig, a founder of the small activist group called Physicians Against Drug Shortages. "It's the only industry that I'm aware of that has a government blessing for paying kickbacks," Zweig said. In 1987, Congress amended the Medicare anti-kickbacks law by exempting GPO fees. In 2011, five U.S. Senators asked the Federal Trade Commission to re-examine the legal exemption and investigate whether GPO fees "suppress competition." GPOs have fought hard to maintain their exemption from the anti-kickbacks law and to repel other regulatory burdens. The I-Team tallied more than $3 million in lobbying expenditures from five of the biggest GPOs in 2014. GPOs have also pushed back against suggestions that their fees, usually 3 percent or lower, are somehow the cause of drug shortages. "The shortages are caused by manufacturing issues," said Curtis Rooney, who is president of the Healthcare Supply Chain Association, the trade group that represents GPOs. "That's unfortunately a common issue where manufacturing processes break down and those companies go offline," Rooney said. Consolidation among makers of generic injectables has also resulted in fewer total manufacturing plants, so the FDA has fewer options when asking drug companies to ramp up supply. "It's not like they can just call up and say, 'Joe can't make magnesium for us. Can you make it for us?'" said Leigh Briscoe-Dwyer, chief pharmacy and medication safety officer at North Shore LIJ. Christopher Kelly, an FDA spokesman, agreed manufacturing problems have often been the immediate causes of shortages, but said low profit margins provide little incentive for drug makers to come back online. "This is a complex problem that stems from, among other things, inadequate investment by drug companies into manufacturing operations leading to product quality problems," Kelly wrote in an email to the I-Team. Kelly also suggested it is wrong to assume that FDA regulatory action has perpetuated shortages. "In the case of the companies whose shut-downs contributed to recent drug shortages, the companies themselves made the determination to stop producing drugs," Kelly wrote.